These plates are available to all passenger cars & light trucks for an extra fee. 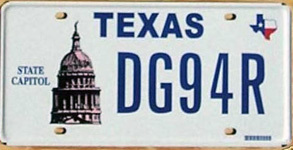 Plates with #BB01B or with round boltholes are samples, photo from TXDOT. Available as: Personalized, disabled, .. This plate is available to all motorists for a passenger car or light truck. This plate is available to all motorists for a passenger car or light truck. $22 is to be used by the Texas Veterans Commission in making grants to benefit projects sponsored by the Air Force Association of Texas. This plate is available to all motorists for a passenger car or light truck. $22 of the application fee goes to the Texas Department of Agriculture to provide additional funds to the American Quarter Horse Foundation to benefit equine research, scholarships and educational programs. $25 goes to a fund that provides civil legal services (such as protective orders, wills, and child support orders) to Texans who could not otherwise afford legal advice. benefits improvement of Big Bend National Park. $22 of the $30 application fee goes to the Office of the Attorney General to provide funds to the Big Brothers/Big Sisters organization. The funds will go directly to fulfilling the mission to help children reach their potential through professionally supported one-to-one relationships. The funds will also be used for recruiting volunteers and maintaining superior programs for children across the state. $22 of the $30 application fee goes to the credit of the be a blood donor account under Section 162.016, Health and Safety Code. AKA Texas Commission on Alcohol and Drug Abuse. Benefits drug abuse prevention programs. $22 of the $30 application fee to goes the credit of the state highway fund. 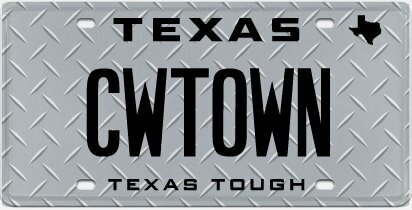 Prior to 9/03, this plate was only available to CCA members. $22 of each fee collected goes to the credit of the Texans Conquer Cancer account established by Section 102.017, Health and Safety Code. $22 goes for use only by the Texas Higher Education Coordinating Board in making grants to benefit Texas Cotton Producers, Inc., for the sole purpose of providing scholarships to students who are pursuing a degree in an agricultural field related to the cotton industry. $22 of each fee collected goes to the public entity that provided public funds for the construction or renovation of the facility in which the professional sports team plays its home games or that provides public funds for the operation of that facility. $22 of the $30 application fee goesinto a special fund administered by the City of Dallas for the maintenance of the area surrounding the American Airlines Center. $22 of each fee collected goes to the public entity that provided public funds for the construction or renovation of the facility in which the professional sports team plays its home games, or that provides public funds for the operation of that facility. $22 goes to the Texas Commission for the Deaf and Hard of Hearing for direct services programs, training, and education. $29.50 goes to the credit of the state highway fund. $22 goes to the Texas Parks and Wildlife Dept. $20 used by the Texas Higher Education Coordinating Board in making grants to benefit educational projects sponsored by the Girl Scout Councils of Texas. $32 goes to the Safe Routes to School Program. $25 of each fee collected goes to the credit of the "Go Texan" partner program account promoting Texas agricultural products. $22 goes toward construction of Relaint Stadium. Benefits the Texas Department of Economic Development's tourism activities. AKA Texas Parks and Wildlife Conservation. Benefits the Texas Parks and Wildlife Capital account. $22 goes to the Texas Education Agency to make grants to State Council Charities. Benefits the Court Appointed Special Advocates (CASA) account in the state treasury to be used by the Texas Attorney General's Office. $22 goes to the Texas Department of Health for use in the Birth Defects Registry. $22 of the $30 application fee goes to the credit of an account in the state treasury. Money in the account may be used only by the Parks and Wildlife Department to support the activities of the Texas Marine Mammal Stranding Network in the recovery, rehabilitation, and release of stranded marine mammals. $22 goes to the Texas Cooperative Extension for graduate student assistantships within the Texas Master Gardener program. Officially a Collegiate plate, as MD Anderson is a part of the U. of Texas. $22 of the $30 application fee goes to the credit of the El Paso Mission Restoration account in the state treasury. Money in the account may be used only by the Texas Historical Commission in making grants to the Socorro Mission Restoration Effort to be used for the purpose of the preservation and rehabilitation of the Socorro Mission. 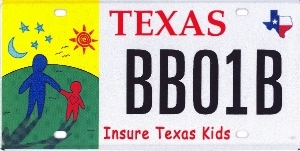 A large variety of personalized plate designs offered by a private vendor. Click the plate at right to see some designs. $22 goes to the Texas Department of Economic Development in making grants to the Daughters of the Republic of Texas to be used only for the purpose of preserving Texas historic sites, or funding educational programs that teach Texas history. $22 goes to the U. S. Olympics trust fund -Texas. Prior to 9/2003, this plate was available only to an organ donor, donor family, transplant recipient or recipient family member. Plate is sponsored by LifeGift Organ Donation center in partnership with the Heart Exchange Support Group. Benefits the Texas Parks and Wildlife Capital account to support State Parks. $25.00 is to be appropriated only to Texas A&M University-Kingsville to provide financial assistance to graduate students in the College of Agriculture and Human Sciences. $22 of the fee is used by the Texas Education Agency to promote bicyclist safety, education, and access through education and awareness programs; and training, workshops, educational materials, and media events. $22 of the $30 application fee goes to the credit of the general revenue fund to be used only by the Texas Department of Health in making grants to benefit the Texas Dental Association Financial Services for the sole use of providing charitable dental care. $22 goes to the Texas Aerospace Commission in making grants to benefit the Aviation and Space Foundation of Texas for the purposes of furthering aviation and space activities in Texas and providing Columbia Crew memorial scholarships to students. $22 goes to the Special Olympics Texas account. Originally benefited Capitol restoration project; Now benefits general fund. Benefits the Texas Commission on the Arts. $22 goes to the Texas Cooperative Extension of the Texas A&M University System for 4-H and Youth Development Programs. $22 goes to the Parks and Wildlife Department to support a camp for physically disabled, hearing or vision impaired, and diabetic children. $22 goes to the Texas Music Foundation. This design is scheduled to change to feature a new musician every 2 years. Benefits reading through public libraries. 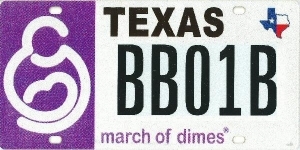 Prior to 9/2003, this plate was available only to TSRA members. Benefits the Texas Mobility Fund. $22 of the $30 application feegoes to the credit of the urban forestry account in the state treasury. Money in the account will be used by the Texas Urban Forestry Council, the designated statewide nonprofit organization located in Texas, whose primary purpose is to sponsor projects involving urban and community: (1) tree planting; (2) tree preservation; and (3) tree education programs. AKA Waterfowl and Wetland Conservation, Ducks Unlimited. $45.00 will be used only by the Texas Parks and Wildlife Department to support the activities of a designated nonprofit organization whose primary purpose is the conservation of waterfowl and wetlands. $22 is to be used by the Texas Education Agency in making grants to benefit the youth and government programs.